Blend Bits: The CutAway Shader - A free Blender add on for architectural visualisation, model cutaways and more. The CutAway Shader - A free Blender add on for architectural visualisation, model cutaways and more. After 3 years in the making - I'm excited to announce the alpha release of the CutAway Shader - a free addon for Blender for artists, architects, scientists and engineers. If you've ever wanted to cut away a cross section of a model, perform an architectural reveal or carry out some tricky special effects then this is the tool for you! It works for still images and for animations. Filming through walls (without damaging or re-dressing the set). Special effects (e.g. turning a winter scene into a summer scene). Wire frame to solid model transitions. Install the addon in Blender in the usual way. File -> Preferences -> File Tab -> Check "Auto Run Python Scripts"
How to download and install the addon - and a very quick intro on how to use the shader. Learn how to reveal the walls and furniture in a house - as seen in T.V design shows and documentaries. 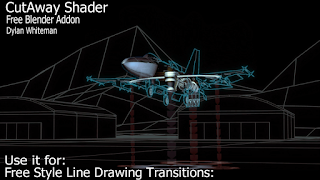 This tutorial jumps right into it with a practical example - and assumes no knowledge of how to use the shader. All the CutAway Shader controls are covered - showing what situations they're useful for and how to use them. It is assumed that the shader has already been installed. A quick overview of the controls. Setting up the CutAway Shader in your scene. Solidify and Rim Fill options. Cutaway Shape: Rectangular and Circular. Cutaway Shape: From Gray Scale Image. Cutaway Shape: By editing the shape of the cutaway plane mesh. Origin Control Buttons: To help with plane scaling and positioning. Parenting Controls: Easily duplicate parent shaders to selected objects. Auto and Manual Refresh: Viewport speedups. Remove All CutAway Shaders button. Each 'mini' tutorial has a heading -- so scroll though the video to get to the desired section, or click on the quick links on the YouTube page. Objects in front of the 'green' side of the cutaway plane (that use the assigned materials) will be made fully or partially transparent. - Add the Cutaway Shader to multiple materials at once (parenting). - Draw a rim at the cutaway cross section. - Cutaway arbitrary shapes based on gray scale images, or the shape of the cutaway plane. After finishing the Open Shader language (OSL) Cycles Lens Flare shader a few years ago, I began experimenting with a few more OSL shader designs. The CutAway shader looked like it would be the quickest to finish (!!!) - so I continued with it. The position of the cutaway plane. The rotation of the cutaway plane. Provides parenting and duplication functions. ... and a lot of other things too. This all took quite a lot of time! Even so, the bulk of the code was finished over two years ago - however, this was followed by the production of 12 demonstration video scenes and several tutorials. As I am kept very busy during the day project managing this (and like most people have a very busy home life too) this project has taken approximately 3 years to get to the alpha release stage. Initially I imagined the CutAway shader performing the obvious tasks - Model cross section cutaways, geological cutaways and architectural reveals. But I soon became excited about other uses the shader could be put to. Special effect Revels: The a shader can easily hide materials on one side of the 'cutaway plane' and (optionally) reveal materials on the other. Winter Forest -> Summer Forrest scene. Ivy growing on statue scene. Island forest -> Island city scene. Revealing car tire tracks in the snow, or in the desert, or on a road. Casting shadows in laser lights shining on a mist. Cat scan style cutaway sections. 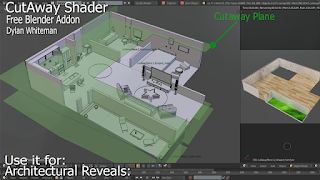 Another interesting use for the CutAway Shader is related to the 3D pipeline work flow. The shader makes it easy to 'punch' any arbitrary shaped hole through scene elements without affecting the base mesh or U.V mapping. If a client wants to move or add an window to a scene at the last minute - none of the existing mesh or U.V work has to be re-worked. The shader will create the new hole with the desired shape and additional geometry (or existing windows etc) can be moved into place. 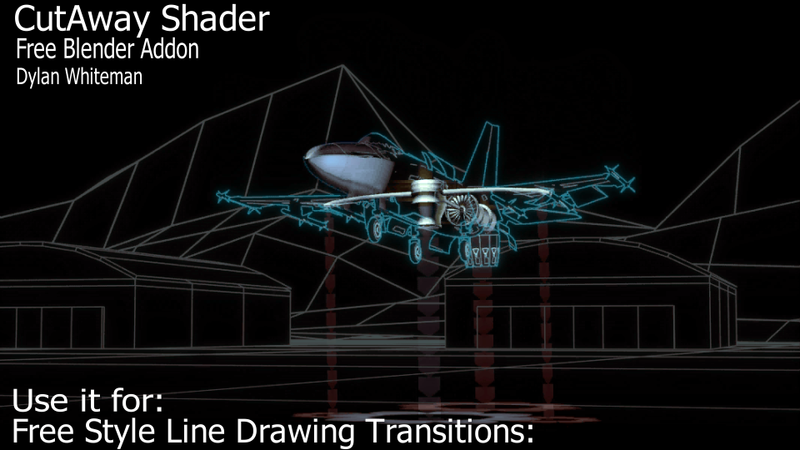 If the pipeline involves mesh assets the are frozen (or scene dressings that are locked) then the shader offers a new method of hiding (cutting away) assets that are blocking the camera view. This can be achieved without actually moving assets or redressing the scene. Filming through sets can be useful for when the desired framing and depth of field results in a lens size that forces the camera to be placed outside the walls of a small set (e.g. a small bedroom, or small space capsule). So, the possibilities for the Cutaway Shader are surprisingly large for such a simple concept! Let me know what you think in the comments below - or e.mail: iReboot42 at gmail dot com. This is an alpha release - so please save your work first. There are a few 'non-standard' features related to the parenting controls of the shader, These allow the CutAway Shader node to be automatically replicated among selected objects in the scene. Child copies of the parent node are added to the material nodes of selected objects (i.e this feature will alter material nodes in your scene). There are many features that could be added to the shader - along with some optimisations. I would like to look at micro displacement of shaded points in the drawn 'rim' to improve this effect. I have wondered when blender might get this.. its been years! Wonderful! Realy very useful feature. Great effort to make the blender rich further. Thanks Dylan. This is very cool, thanks for all of your hard work. I can't imagine all of the hours you must have put in to develop a tool of this complexity. I get AutoRun disabled, with an IGNORE button and Driver 'var' next to it. Maybe I should read the instructions first...DOH! Works great! Realy very useful feature.Works great! Hi ! Thank you so much for this great, helpfull, and pretty easy to use tool ! I've been missing this since I moved from 3sdmax ! I run into a problem when cutingaway from an image which is not in the same driver as Blender : the image is not used at all (I can send an image of the error report). Is there a small dummy reason for that behavior that could be fixed easely ? Hi! I have a problem: My object cuts in the xy-plane. If i add a cutaway plane, it doesnt get recognize as one. Nothing is changing. 2) Re-start Blender and open your file. 3) Add a new cut away plane, and manually delete the old one (if there is one there). IF this doesn't work, you can send your .blend file along with an image to iReboot42 A.T gmail.com then I can have a look. Hope this helps and happy Blending! This is one of those 'alpha release' things! The short answer is its on my 'to do' list to fix - so sorry about the inconvenience at the moment. Option 1) With Blender closed, try double clicking the .blend file to open it. Re-open you alpha image in the Shader and save the .blend file. Here is a bit of a long winded explanation of what's happening. I found this type of problem during development. I wanted the path to the image file to be 'relative' to the .blend file (for better portability) - but the 'relative path' returned by the pyrhon api changes depending on whether the .blend file is opened in Blender (this returns a relate path to the Blender .exe in Wibdows) or whether the .blend file is 'double clicked' (this returns a path relative to the .blend file). I would also like it to work if the object being cut away its 'linked' to from another file. I never found the solution for all cases. After 3yrs of overall development this issue was put on the 'to do next' list - to allow any sort of release! If this is preventing your project from working - I could make you a 'special' version that allows you to specify an absolute path - or something similar - but his could take a while. If you know some Python, I could send you the line number in the code where the path is set. I hope this helps, and apologies for the inconvenience! Cheers Dylan, in the scheme of things its not a problem to move alphas to the blender root directory,its just that i've grown accustomed to keeping blender projects and all other texture/ alpha related stuff on a dedicated drive. Its not a problem to move them to root when needed for a project.Will try your suggestions, thanks! I tried to use it in a very complex model, made with several linked files, but it doesn't seem to work. I can't add the shader node in the compositing. Do I need to append all the files? Almost perfect for my job. I only guess if there's a way to render the cutaway plane, with a specific shader, or it must be transparent/image. My problem is that I'm modeling an under earth cave, and I want to render not only the cut section of the cave, but the cutaway plane itself too (the part outside the cave). I tried with the rim option but it doesn't seem to work for this purpose.